Mister Rogers arrives with a collection of empty food containers which he takes to the sand table for some pretending. With some imagination, he turns the containers into a tunnel, a lake, and an apartment building. Mr. McFeely stops by and offers some a suggestion for making a bridge out of milk cartons and popsicle sticks. Before Mr. McFeely leaves, Mister Rogers gives him a broken umbrella to deliver to Bob Trow. When Mister Rogers calls Bob Trow to let him know he is not in any hurry to have his umbrella fixed, Mr. Trow invites him to come to the workshop for a demonstration. At the workshop, Bob Trow shows Mister Rogers various types of pulleys and how they work. 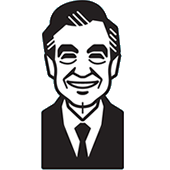 At one point, a pulley is used to lift Mister Rogers off the ground. After the pully demonstration, Mister Rogers and Bob Trow share a few funny magic tricks. In the Neighborhood of Make-Believe, Chef Brockett asks for Corney's help in making a rocking chair cake for some friends' anniversary. Corney takes this opportunity to share his newest invention -- the Rain or Shine Rocker -- a rocking chair with pulley-operated canopy. Lady Aberlin stops by to get some oil for her umbrella so she can be sure it's working properly in case it rains. At the clock, Daniel asks Lady Aberlin if she will help him try out his homemade walkie talkie made of two cans and a string. As they go together to the picnic place to try the walkie talkie, they sing Let's Be Together Today. Finding a nice spot by a bridge, Daniel and Lady Aberlin are able to play with the walkie talkie for just a moment before it starts to rain. Seeking shelter under the bridge, they tell knock-knock jokes as they enjoy the rain shower. Meanwhile, Chef Brockett is staying dry thanks to Corney's Rain or Shine Rocker while Henrietta and X use their umbrellas and talk about the peaceful rain. At the castle, King Friday and Queen Sara are also enjoying the refershing shower. Back at the house, Mister Rogers cleans up the sand table and closes for the week with some comments on friendship: "Getting to be friends is like building bridges. Some people think that friends are always happy, always having fun. Well, that's not true. Friends often have hard times and sad times. But friends can come together again and again and build a stronger and stronger friendship between each other." This episodes gives viewers a glimpse into a rarely seen area of the Neighborhood of Make-Believe: the "picnic place" near the bridge. On March 1, 2018 -- in celebration of the 50th anniversary of Mister Rogers' Neighborhood -- this episode aired along with Episode 107 of Daniel Tiger's Neighborhood. Post Production: TPC Communications Inc.